Forensics, otherwise known as speech and debate, is one of the most popular extra-curricular activities among high school students. This informative book is designed to introduce beginning students to individual forensic events and also to serve as a valuable resource for more advanced students. Each of the seven chapters covers strategies for different competitive events including: Original Oratory, Extemporaneous Speaking, Interpretation of Literature, and Student Congress. Each chapter introduces the event, explains the rules and guidelines, gives tips for preparing for the event, and provides suggestions to help students triumph. Read more...This versatile book is easy to read and can be used either for instruction as a textbook, or as a comprehensive resource book for individual students. 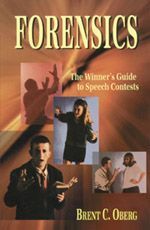 Regardless of whether you are just delving into the world of forensics, or if you are looking for some helpful hints to win you that trophy, Forensics is the book you need to succeed! How we communicate with others is basic to our personal satisfaction, fulfillment, and success in life. Interpersonal communication is really the study of how we live every day.